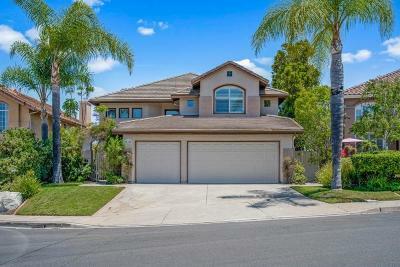 This lovely view home is move in ready and has been impeccably maintained. Light & bright, with high ceilings in living room and formal dining room and plantation shutters throughout. Open family room with fireplace adjacent to the updated kitchen. Bedroom & full bath downstairs. Private backyard with great views, built in BBQ, sink and eating area, perfect for entertaining. Low monthly HOA. Enjoy the Westwood community center with pools, tennis, playground, basketball, children's play area, club house., From the moment you walk through the front door, you will want to call this meticulously maintained home- HOME! This home is located on a cul-de-sac and no through street. Warm hardwood floors throughout main floor and plantation shutters. The updated kitchen features slab granite counters, custom tile backsplash, under counter lighting, 5 burner gas range, double ovens, built-in microwave and views. Separate eating area in kitchen opens to family room with gas fireplace. Main floor bedroom with double doors, walk in closet. Updated guest bath with tile floors, and beautiful tile shower, copper sink, custom backsplash with granite countertop. Upstairs you have a built-in desk in small sitting area in hallway. Master bedroom with vaulted ceilings, his and her closets, dual sinks, oval tub, tiled shower. Very private backyard with views, entertain on your built in BBQ, sink and eating area. Close to I-15, Westwood Elementary, as well as Westwood Club that features a large pool, playground, work out room, basketball, and tennis courts! Located in the Award-Winning Poway School District! Low monthly HOA.